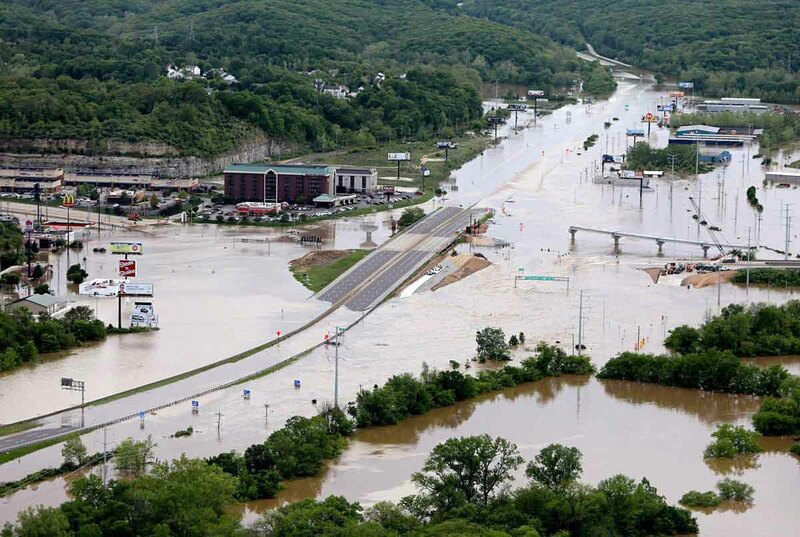 WASHINGTON (CNS) — When a storm front hit several Southern and Midwestern states, including Missouri, in early May, it spared Sacred Heart Parish in the city of Valley Park, about 20 miles southwest of St. Louis. “We were fortunate,” said David Broemmelsick, of the parish’s communications office, as he considered the great luck that befell on Sacred Heart’s property, including its school, as heavy rains caused the nearby Meramec River to overflow, closing off a nearby interstate and leaving many other properties underwater. Although the parish’s buildings escaped harm, the school and other operations closed for the week because many couldn’t drive on the flooded roads or in the perilous weather, and the parish decided to offer charity to the local the community via its best asset: its physically higher ground. The post office and a local food pantry called Circle of Concern made use of the parish’s facilities. Part of the school was used as a place to store, sort mail, and organize deliveries, and the parking lot received large trucks with essential items for the food pantry. The water was receding May 5, but some places in the area still look like islands and it is strange to hear silence where, normally, a six-lane highway produces sounds of life, Broemmelsick said. The record-breaking storms, stretching from Texas to Michigan, are said to have left at least 20 dead in a mix of incidents involving flooding and tornadoes. Arkansas and Missouri were the hardest hit, but damage extended to Texas, Mississippi, Oklahoma, Louisiana, Tennessee, and Alabama. Some areas saw as much as 11 inches of water. Sacred Heart parishioners who could reach the parish showed up to help with sandbagging and to extend services in any possible way, Broemmelsick said, and even those who couldn’t physically lend help said they would accompany the volunteers in prayer. Although the rough weather seemed to have passed, the Valley Park community was still in recovery mode as of May 5 and many were wondering if regularly scheduled activities, such as first Communions, would still be taking place. The road to recovery might be long, but “we’ll get there,” Broemmelsick said.